Omega Psi Phi Fraternity “Educator” Purple/Gold License Plate Frame- New! Order of the Amaranth Cut Out Car Emblem-New! Zeta Phi Beta Sorority “So Sweet” Silver/Blue License Plate Frame- New! Jackson State University JSU Football Jersey- Size 3XL-New! Phi Delta Theta Fraternity Dri-Fit Polo- Navy- Size Small-New! Phi Beta Sigma Fraternity Lanyard- New! Mason Masonic Tubal Cane Cut Out Car Emblem-New! Jackson State University JSU Shirt- School Mascot- Size 3XL-New! Alpha Phi Sorority Flag- Ocean-New! Kappa Alpha Fraternity American Flag Shirt- Size Small-New! 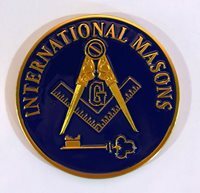 International Mason Masonic Auto Emblem-New! Bethune-Cookman University Hoodie-Size Large- New! Alabama A&M University Lightweight Cardigan-Style 2- Size Large- New! Jackson State University Hoodie-Size Medium-New! Delta Delta Delta Tri-Delta Sorority Flag- Floral-New! Kappa Alpha Psi Fraternity Line Jacket- Cream- Size 4XL- New! Delta Delta Delta Tri-Delta Sorority Flag- Ocean -New! Zeta Tau Alpha ZTA Sorority Sunglass Straps – Marble-New!